The North Star has meant many things to many people over the years. Most often, it has meant guidance, a beacon, something to count on, something that can lead, that can be trusted. It’s something that helps us get our bearings, that tells us where we are and shows us where we’re heading. In life, as in navigation, we sometimes need to pause to get our bearings, to figure out which way we’re heading, to look for our North Star. Maybe this blog post can be that sort of pause. I had another post planned, all set to post itself at five minutes after midnight — but it wasn’t quite what I wanted to say today. I’ll save it for another day. After I fell a few weeks ago, I found that for a while I felt bereft of ideas or inspiration for writing. I didn’t get much done. It’s no use berating ourselves at such times — sometimes our minds just need to rest for a time. But we can’t rest, we can’t drift, forever. There comes a time when we have to look for our North Star again. We have to find our direction. I’m grateful that after that period of drifting, the ideas are coming back. Writing that had been off course has found its way again. This simply-worded but profound allegory/fable tells of a boy on a journey — a journey for which he does not know the destination. At first he is hurried along by others, he is buffeted by circumstance, he feels in the dark many times. Gradually he grows to understand that we all have different journeys, and he begins to find his own path, to follow his own dreams, to follow his own North Star. That is the key question of the book, and the key question for our lives. Sometimes we get distracted from following our own path, from following our dreams. Sometimes others hurry us along, or think we should follow a path that has worked for them but which may not work for us. Sometimes we get lost and discouraged along the way, or it just seems too hard to get where we are going. That’s when we need to look for our own guideposts, our own signs that we are heading in the right direction. For me, one guidepost was the sudden “aha!” of knowing how to revise a picture book manuscript that had been puzzling me for weeks. Another guidepost is renewed determination to keep myself moving forward on the path toward publication. The guideposts will continue to appear, my own North Star will continue to lead, when I ask myself truly where it is I want to go, and do what it takes to get me there. Inspiring post! It’s good to take time out, and, I am pleased that you have found your writing way. I will be taking a break myself, early next year. Thanks, Diane. Going on a vacation? This is so good, Beth, and so important to remember. We each have a unique journey that God has called us to continue. Following others on their own path can be frustrating and confusing for us. Thanks for sharing your inspiring thoughts with us! Thanks, Jarm. You’re so right. I want to set my sails towards more financial independence. I have felt an urge to write more on my blog, which doesn’t seem like it would be the right thing since I get no money for it, but my heart goes there. I am finding a stronger voice doing it. I also have more ideas in mind for plays. Soon, they will bear fruit. This all sounds so good, Mary. If your heart is in your blog, and you’re strengthening your voice by writing there, then it’s obviously a good thing to be doing. And excited to learn that there are more plays in your creative mind, as well! Thanks for this perfect post once again Beth. I also have been recovering from a broken ankle and I thought I could use this time to write but alas it hasn’t happened. I tend to dwell on self pity too much I think. I must find my North Star. We can encourage each other to keep looking toward our North Star. It isn’t always easy. I love this post! It’s so tough, but so important to get moving again. Sometimes a slowdown (or a complete stop) can be necessary (or forced). Keep your eye on that star! I know I will! Thank you, Genevieve! We’ll keep our eyes fixed on the star! Strange. I’ve never seen the North Star star. Well, maybe I HAVE, but I just didn’t know it was the North Star. 😉 Hmmm… MY North Star is to be a writer. I’m glad your North Star is to be a writer. I know you’ll achieve that goal — you’re achieving it every day! Some clear night, see if your family can go out in the country where it’s easier to see the stars. 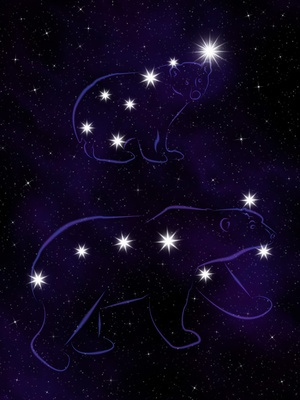 Find the Big Dipper, and then follow the line made by the farthest side of the Big Dipper. It leads straight to the North Star. How perfectly perfect. Sometimes, answering the question, “Where do you want to be going?” can be a difficult one. Having others point us where we should go, tell us what should work or “force” us on paths they deem the right ones is a bit easier. We don’t have to be truly responsible to our own hearts or for our choices because they’re being made for us. But to really go for what we want, even if that may not fit the “cool” path or the “uber rich” path…that is being true to yourself and following your own north star. How perfectly perfect is this comment? Thank you, Angela. I was very moved by your post today Beth. I especially like how you tied it in with Peter’s book. I do believe the down times, particularly after an injury rock us a bit, but are needed for healing — which you have done on your own time. I’m so glad you’re feeling better. It took an injury to point me in a new direction, so I understand this well. Thank you, Pat. Your injury was a very dramatic and traumatic one. You have come so far since then, and I’m so glad you are involved in the world of children’s books now. Just lovely, Beth. Thank you.